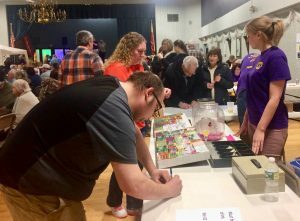 FULTON – Less than 300 tickets remain for The Fulton Lions Club annual “Lion’s Loot” drawing, said Ron Browning, co-chair. The chance of winning up to $10,000 is quickly coming to an end, and a recent sweepstakes sold out. The event starts 1 p.m., April 28 at the Fulton Polish Home. Doors open at noon. Every ticket sold will be in the drum for every drawing. You do not need to be present to win, and you can win more than once. Prizes include one $10,000, $7,000, and $5,000 winner as well as five $1,000 drawings and six drawings of $500. For more information or ticket applications, contact either event co-chair Browning at 315-561-9021 or Dingman at 315-450-2678.